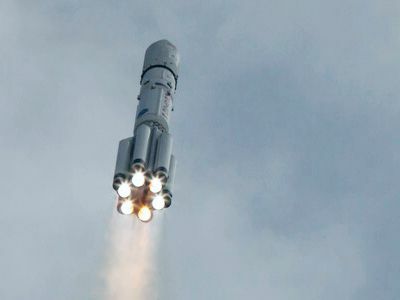 RESTON, Va. (ILS PR) — ILS, a leading provider of commercial launch services, announced multiple launch assignments for Proton Medium launches that will include the use of both the 4.35 meter and the new 5.2 meter payload fairing. The missions will take place beginning in late 2019 from Pad 24 at the Baikonur Cosmodrome in Kazakhstan. I like this line …. “the benefits of the standard, flight-proven Proton Breeze M”. Breeze has been the root cause of many Proton failures since its introduction in the past century. I believe the program is on the order of 40 years old now and it’s still ending flights early. Yeah, bringing up Breeze M was certainly worthy of a spit take. I also like the unusual anonymity of the alleged Proton Medium contractees. Press releases like this are essentially brags about one company landing another company as a client. Both companies are named and each effusively praises and flatters the other with direct quotes from each firm’s Big Cheeses. There is also typically one such press release issued for each new client contract. It’s not like we haven’t read a metric buttload of these things in exactly that format right here on Parabolic Arc over the years. The one about DigitalGlobe and SpaceX two posts up is a classic of the genre. Here we have something more closely resembling the PR equivalent of a mass grave with some unspecified number of nameless new occupants tossed in, each allegedly having signed for an equally vague total number of launch missions. ISTM those launches are likely captive missions for the Russian government, not commercial missions. Otherwise, as you say, they be tooting their horn.